Decentralised electoral administration: a cure or curse for US elections? Toby S. James from the University of East Anglia considers whether the decentralised nature of US elections helps or hinders the smooth running of electoral administration. He’s not far wrong. Expert assessments have repeatedly demonstrated that voter fraud is exceptionally rare (as is also the case in the UK, by the way). Instead, claims of voter fraud are often made for more disingenuous reasons. In the US in particular, this sort of rhetoric has historically been used as a pretext for introducing polling station “monitoring” systems, which function to intimidate and deter opposition supporters from voting. Another tactic, is to stir up panic over supposedly widespread voter fraud push the case for stringent voter ID requirements, which can greatly restrict turnout among likely opposition voters. The grounds on which these tactics are deployed are generally spurious and disingenous. But just because these claims of voter fraud and election-rigging aren’t well founded or honest doesn’t mean all is well with the American system. Trump’s threat of legal action immediately brings back memories of the Bush-v-Gore debacle of 2000, where a knife-edge election was dependent on the result in Florida. That state’s poorly designed ballot paper led to voters being confused and voting for the wrong person – and it has since been proven that the number of citizens who voted for the wrong candidate by mistake was larger than margin of George W. Bush’s victory. This experience triggered a major investment in American’s electoral machinery with the Help America Vote Act (HAVA) distributing omore than $3 billion to state officials – but there are still serious problems. The Pew Research Center has created a Performance Index to demonstrated the state-by-state variation in the quality of America’s electoral machinery. The most recent data from 2014 suggests that North Dakota runs the best elections overall – while Alabama runs the worst ones. If you were a voter in Washington state in 2014, you could expect to wait only around 40 seconds to vote while the average wait time in North Carolina was nearly nine minutes. Virtually no postal ballots were rejected in Washington DC, but Washington state, which conducts its elections entirely by post, rejected 1.3% of all its mail ballots. As election day approaches, officials in New York City have warned that their infrastructure may not be able to deal with a high turnout. Not an altogether reassuring picture, then. So how can America’s elections be improved? so decentralised … Elections are run by state and local officials which means that there are places like Florida, where you have got a Republican governor, whose Republican appointees are going to be running and monitoring these election sites … The notion that Trump loses Florida because of “those people” … is irresponsible. Put simply, the argument is that localised administrative systems prevent electoral fraud. In the US, each state has considerable discretion over the procedures it uses. There will be also be thousands of counts across the country on the night, each reporting their own result. They will be organisationally and technologically independent from each other, meaning that to orchestrate a fixed result even at the state level would be nigh on impossible. Any Russian attempt to fix the result would therefore face the longest of odds. But it is unusual for anyone, and especially the Democrats, to laud the US system for its decentralisation. This same structure has long been blamed for many of the problems with the system, and for many of the inequalities in the services provided to voters. Yale academic Heather Gerken has argued that “localism” has been the cause of a great many problems in American elections. Renowned elections expert Robert Pastor claimed that the US system has been “decentralised to the point of being dysfunctional”. The experience of 2000 begat a new worldwide field of academic study striving to identify the best ways of running elections. My own recently published research shows that introducing some degree of centralisation in an already decentralised system can have both positive and negative effects. It can provide a more consistent experience for the voter, ensure some minimal standards and reduce local managerial errors. But there is a cost: sensitivity to the needs of each locality can be reduced – and it can be expensive to issue blanket instructions and uniformity where it is not necessarily needed. There are other known fixes from academic research: recruiting and training high-quality poll workers, using performance management schemes and simply investing more in electoral services are high up on the list. On all these measures, the US could do much better. 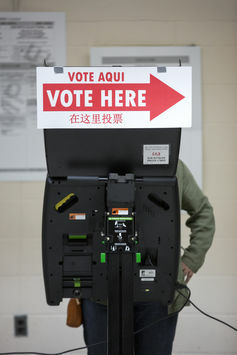 Trump may be wide of the mark with his claims of election “rigging”, but if these claims sound plausible to much of the American public, it’s partly because the country has failed to adequately tighten the nuts and bolts of elections even after seeing the machine fail spectacularly. If voters don’t trust the process, that’s a serious problem for democracy; once this election is done, the problem needs to be tackled head-on.